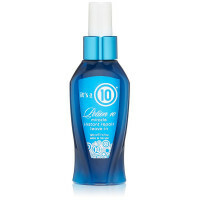 Unlike shampoos that strip away hair’s natural oils and resiliency, It’s a 10 Potion 10 Miracle Repair Shampoo actually strengthens and corrects hair with each use. This rich, color-safe formula builds to a thick, foamy lather that penetrates the entire hair shaft from roots to tip, healing the cuticle and sealing dry, split ends. Essential natural compounds and botanical moisture impart silky softness and manageability while also protecting against environmental stressors and heat styling. Gentle and clean rinsing, hair is left feeling strong, bouncy, and full of body. Over time, hair’s condition improves to its absolute best – vibrant and beautiful in every way.